Angela Hewitt has earned a richly deserved reputation for her interpretations of Bach and the Baroque, and something of that characteristic clarity illuminates her Schumann performances. Her first disc of this repertoire was praised for its ‘seemingly effortless but always adventurous interpretations … her poise and amplitude lending it an unearthly beauty’ and this second volume, containing some of the composer’s most bewitchingly beautiful music, should be no less lauded. Did you not realize that I played it because I knew of no other means to show a little of what was going on inside me? I couldn’t do it secretly, so I did it publicly. Didn’t you know that my heart trembled? … You had to see, to feel from my playing what was going on in me. The way you played my Études—I won’t ever forget that; they were absolute masterpieces the way you presented them—the public can’t appreciate such playing—but one person was sitting there, no matter how much his heart was pounding with other feelings, my entire being at that instant bowed down before you as an artist. Their letters were not all without conflict. If there was a long gap in their correspondence, the fear of what that might mean became a strain and produced some probably inevitable quarrels. It couldn’t have been easy for Robert, either, stuck at home wondering how he was ever going to get the money together that Clara’s father demanded as a condition of their marriage. In February 1838 he wrote rather mournfully: ‘My path is a rather lonely one, I know; no roars of applause from a great crowd stimulate my work as I go.’ Many other young couples would have given up and found someone else when faced with such obstacles; but the music was there to hold them together. Despite such adversity, Schumann had amazing spurts of creativity. If he couldn’t see his beloved, he would at least write music for her to play. Most of the big piano works originate from 1834 to 1839, including the three on this recording. They are quite different from each other, which in a way makes it more interesting to hear them back to back. Kinderszenen (Scenes from Childhood), Op 15, is of course the most well known, and beloved by all. It is initially deceptive on two fronts. At first it looks easy, but it is not at all, requiring a great mastery of touch and range of expression, and a poetic delivery. Secondly, it is not simply a collection of naïve pieces for children. When the poet and critic Rellstab (who gave the title ‘Moonlight’ to Beethoven’s Sonata Op 27 No 2) said that Schumann had set upon his piano a howling child and sought to give a realistic imitation of its sounds, Schumann angrily answered that it was a recollection of youth for adults, and that the titles had been thought of afterwards. Schumann’s childhood was far from ideal: his sister committed suicide when he was sixteen, and his father died shortly thereafter; and his mother made him study law against his wishes, finally allowing him to devote himself to music only when he was twenty years old. It was like an echo of something you once said, when you wrote to me that ‘I sometimes seemed to you like a child’—in short, I felt as though I were in pinafores again and knocked off around thirty quaint things, from which I selected twelve and called them ‘Scenes from Childhood’. You will enjoy them, but you’ll certainly have to forget yourself as a virtuoso. The set (which in the end includes thirteen pieces) begins with Von fremden Ländern und Menschen (From foreign lands and people), whose disarming five-note theme recurs throughout the set. Kuriose Geschichte (A curious story) not only continues the expressive bass line already apparent in the first piece, but has some colourful octave doubling in the middle voice which should be brought out. In Hasche-Mann (Blind man’s buff), children vividly run around with their giggles being heard loud and clear. That opening figure is transformed into the pleas of an entreating child in Bittendes Kind which has some lovely counterpoint and ends on a question mark. Obviously the child got what he wanted because in the next piece he has found Glückes genug (Perfect happiness). In Wichtige Begebenheit (An important event) we must let the child engage in his own version of pomp, which wisely tails off at the end, allowing a beautiful transition into one of the most famous tunes ever written, Träumerei (Dreaming). I have often played this for an otherwise noisy group of school children as an example of a piece where you must be totally quiet to hear what is being said, asking them to dream something special at the same time. If ever an example is needed of how Schumann’s music must not be played metronomically in four-square bars and even beats, this is it. And what lovely counterpoint to go along with that melody. We continue that cosy feeling in Am Kamin (By the fireside), although some fairly lively dialogue is going on as well. Incidentally, the difference in metronome markings between those of Clara and those of Robert are sometimes quite radical, and this piece is one example (Robert marks it at 138 to the crotchet, Clara at 108). The rocking of the knight on the hobby-horse is marvellously portrayed in Ritter vom Steckenpferd, with the right hand mimicking the back-and-forth movement it makes. We are back in a dreaming mode in Fast zu ernst (Almost too serious), with a syncopated melody adding to the feeling of fantasy. In Fürchtenmachen (Frightening), quite nonchalant lines alternate with threatening moments. Finally it all becomes too much for the child, and sleep comes as the cure for everything (Kind im Einschlummern), again leaving us suspended on the last chord. The adult has the final word in Der Dichter spricht (The poet speaks). There are not many endings in music as poignant as this one. Questions are asked after the initial statement, elaborated upon in a short recitative, and brought to their ultimate conclusion on a final chord which, ironically enough, demands the stretch of a tenth—something a child could never do. What makes you think that I cannot bear your Davidsbündler dances? So far I have not been able to get two hours’ peace to myself to dedicate to them, and they need that. None but I could decipher such writing. She must have found the time in the next few weeks because on 3 March she wrote again, saying that she liked them very much but found them a bit too much like Carnaval, which she preferred. Our tastes differ: I would rather play the ‘Davidstänze’ (as Clara called them) ten times than hear Carnaval once. and bear pain with courage. Schumann told Clara that he was never so happy at the piano as when he was composing these pieces, and that they included many marriage thoughts (they were secretly engaged a week before he began composing the work). But this is not so much the type of happiness encountered, for instance, in Carnaval. It is a happiness that stems very much from sorrow—from having already suffered a lot, from not yet having obtained one’s greatest desires. He wrote that the work compared to Carnaval ‘like faces to masks’, meaning, it seems, that this is the real thing. The catalogue number Op 6 is misleading and has nothing to do with when the work was composed. Robert saved that particular opus number because the Davidsbündlertänze opens with a motto from one of Clara’s compositions, a Mazurka included in her own Op 6. He revised the work the following year, changing the title to simply Davidsbündler and adding the subtitle ‘Eighteen Characteristic Pieces’. When I bought my first score of it in 1975 that was the one I happened to pick up. I do, however, incorporate a few things from the earlier version in my interpretation. I am enormously excited with the idea of your Second Sonata; it reminds me of so many happy as well as painful hours. I love it, as I do you. Your whole being is so clearly expressed in it, and besides, it’s not too obscure. Only one thing. Do you want to leave the last movement as it was before? Better to change it and make it a bit easier because it is much too difficult. I understand it and can play it alright, but people, the public, even the connoisseurs for whom one actually writes, don’t understand it. You won’t take this badly, will you? Robert didn’t take it badly, and wrote another finale which he felt also went better with the first movement. Of his three piano sonatas, the G minor is by far the most concise. It is a work of great sweep and passion, typically combining dramatic urgency with moments of rapt tenderness. 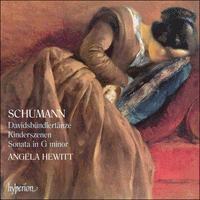 Schumann doesn’t wait to get our attention—he demands it in the first bar with that sudden, broken G minor chord. The first challenge he throws at the player is to mark the opening ‘As fast as possible’, only to urge him or her to go ‘faster’ and ‘still faster’ before the end is reached. The opening theme, which is imitated in the bass, uses the partial descending scale that became Clara’s motto in many of his piano works—a ‘cry from the heart’ for her when they were unable to be together. The beautiful slow movement, marked getragen (solemn), was originally a song that Robert wrote when he was eighteen years old. The calm doesn’t last for long, though. With the Scherzo comes the one bit of humour in the sonata: in its episodes in the major mode there is certainly a twinkle in his eye. The ‘new’ finale makes extensive use of broken octaves to express its restlessness, and the Clara motto appears in the lyrical second subject. The music works up to a feverish climax and a dramatic pause over a diminished seventh chord. The ensuing cadenza goes like the wind, never once letting up. Clara certainly got what she wanted. N’as-tu pas compris que je les ai jouées parce que je ne voyais aucun autre moyen de montrer un peu ce qui se passait en moi? Comme je ne pouvais pas le faire secrètement, je l’ai fait publiquement. Ne savais-tu pas que mon cœur tremblait? … Il fallait que tu voies, que tu sentes à mon jeu ce qui se passait en moi. La manière dont tu as joué mes Études—je n’oublierai jamais ça; ta façon de les présenter en a fait des chefs-d’œuvre absolus—le public ne peut apprécier un tel jeu—mais quelqu’un était assis là, peu importe que d’autres sentiments fissent battre fort son cœur, tout mon être, à cet instant, s’inclina devant l’artiste que tu étais. Toutes leurs lettres n’allèrent pas sans conflit. S’il y avait une longue interruption dans leur correspondance, la crainte de ce que cela pouvait signifier se muait en stress et engendrait des querelles, probablement inévitables. Cela ne devait pas non plus être facile pour Robert, coincé chez lui à se demander comment il allait bien pouvoir rassembler l’argent que le père de Clara avait mis comme condition au mariage. En février 1838, il écrivit assez tristement: «Mon chemin est, je le sais, plutôt solitaire; aucun applaudissement d’aucune foule immense pour encourager mon travail.» Face à de tels obstacles, bien d’autres jeunes couples auraient abandonné, trouvé quelqu’un d’autre; mais eux, la musique était là pour les réunir. Malgré cette adversité, Schumann eut de surprenants assauts de créativité. S’il ne pouvait voir sa bien-aimée, au moins pouvait-il lui écrire de la musique: les années 1834–39 sont à l’origine de presque toutes ses vastes pièces pour piano, y compris celles enregistrées ici. Elles sont toutes trois fort différentes, d’où, en un sens, l’intérêt de les écouter à la file. Kinderszenen (Scènes d’enfants) op. 15 est, bien sûr, la mieux connue de tous, la mieux aimée aussi, même si elle est au départ doublement trompeuse. D’abord, elle paraît facile, or c’est loin d’être le cas, vu toute la maîtrise de toucher, tout l’éventail expressif et le rendu poétique qu’elle exige. Ensuite, elle n’est pas un simple recueil de pièces naïves pour enfants. Lorsque le poète et critique Rellstab (qui baptisa «Clair de lune» la Sonate op. 27 no 2 de Beethoven) dit que Schumann avait jeté sur son piano un enfant braillard et qu’il avait cherché à donner une imitation réaliste de ses bruits, l’intéressé répliqua avec colère que c’était un souvenir de jeunesse pour adultes et que les titres avaient été pensés après coup. Schumann connut une enfance tout sauf idéale: sa sœur se suicida quand il avait seize ans, et son père mourut peu après; en plus, sa mère l’obligeait à étudier le droit, ne le laissant se consacrer enfin à la musique qu’à l’âge de vingt ans. Était-ce comme un écho à une chose que tu m’as dite une fois, quand tu m’as écrit: «je t’ai parfois semblé comme une enfant»—bref, je me suis senti comme si je portais de nouveau une robe chasuble et j’ai troussé une trentaine de petites choses vieillottes, j’en ai sélectionné douze et je les ai appelées «Scènes d’enfants». Elles te plairont mais il te faudra certainement oublier que tu es une virtuose. Le corpus (qui compte, en définitive, treize pièces) s’ouvre sur Von fremden Ländern und Menschen (Des pays et des gens étrangers), dont le désarmant thème de cinq notes revient tout au long du recueil. Kuriose Geschichte (Curieuse histoire) poursuit l’expressive ligne de basse déjà manifeste dans la première pièce, tout en présentant un pittoresque redoublement à l’octave, à la voix intermédiaire, qu’il faudrait faire ressortir. Dans Hasche-Mann (Colin-Maillard), les enfants courent en tous sens, avec leurs petits rires qu’on entend haut et clair. Cette figure initiale se métamorphose en suppliques d’un enfant implorant dans Bittendes Kind, qui arbore un adorable contrepoint et s’achève sur une interrogation. Dans la pièce suivante, l’enfant a, de toute évidence, obtenu satisfaction: il a trouvé le Glückes genug (Bonheur parfait). Dans Wichtige Begebenheit (Événement important), il nous faut le laisser livrer sa propre vision du faste, qui fléchit sagement à la fin, permettant une splendide transition avec l’un des plus célèbres airs jamais écrits, Träumerei (Rêverie). Je l’ai souvent joué à des écoliers bruyants, pour leur montrer une pièce où il faut être absolument tranquille si l’on veut entendre ce qui se dit, et je leur demandais alors de rêver à quelque chose de spécial. S’il est une pièce qui prouve combien il ne faut pas jouer la musique de Schumann métronomiquement, en mesures et même en temps inébranlables, c’est bien celle-ci. Et puis, quel charmant contrepoint nous avons pour aller avec cette mélodie! Nous ne quittons pas ce sentiment douillet dans Am Kamin (Au coin du feu), même si un dialogue joliment enlevé se fait aussi entendre. Soit dit en passant, il arrive que les indications métronomiques de Clara et de Robert soient radicalement différentes, et cette pièce en est le parfait exemple (avec pour valeur la noire, Robert marque 138 et Clara 108). Le balancement du chevalier sur le cheval de bois est merveilleusement rendu dans Ritter vom Steckenpferd, la main droite mimant le va-et-vient du cheval. Nous retrouvons l’onirisme avec Fast zu ernst (Presque trop sérieux), où une mélodie syncopée ajoute au sentiment de fantaisie. Fürchtenmachen (Faire peur) voit des lignes résolument nonchalantes alterner avec des moments menaçants. Finalement, c’en est trop pour l’enfant et le sommeil vient tout guérir (Kind im Einschlummern), nous laissant de nouveau en suspens sur le dernier accord. L’adulte a le dernier mot dans Der Dichter spricht (Le poète parle). Rares sont, en musique, les épilogues aussi poignants que celui-ci. Après l’énonciation initiale, des questions sont élaborées dans un court récitatif puis amenées à leur conclusion sur un accord final qui, assez ironiquement, exige l’amplitude d’une dixième—ce qu’un enfant ne pourrait jamais faire. Qu’est-ce qui te fait penser que je ne puis supporter tes danses des Davidsbündler? Je n’ai pas encore réussi à avoir deux heures de paix pour m’y consacrer, et c’est ce qu’elles exigent. Il n’y a que moi qui puisse déchiffrer une telle écriture. Elle dut trouver le temps dans les semaines qui suivirent car, le 3 mars, elle lui récrivit pour lui dire qu’elle les aimait énormément mais qu’elle les trouvait trop proches de Carnaval, qu’elle préférait. Nos goûts divergent: j’aimerais mieux jouer dix fois les «Davidstänze» (comme Clara les appelait) qu’entendre une fois Carnaval. La joie s’unit à la douleur. Affrontez la douleur avec courage. Schumann dit à Clara n’avoir jamais été aussi heureux au piano qu’en composant ces pièces, qui renfermaient de nombreuses idées de mariage (ils s’étaient fiancés en secret une semaine avant qu’il se mette à les composer). Mais ce n’est pas vraiment le même bonheur que dans Carnaval, par exemple. Non, c’est un bonheur largement né de la tristesse—d’avoir déjà tant souffert, de ne pas avoir vu ses plus chers désirs assouvis. Schumann écrivit que comparer cette œuvre à Carnaval, c’est comme «comparer des visages à des masques», signifiant par là, semble-t-il, que c’était du vrai de vrai. Le numéro d’opus 6 du catalogue est trompeur car il est sans rapport aucun avec l’époque à laquelle cette œuvre fut composée. Robert le garda juste parce que les Davidsbündlertänze s’ouvrent sur un «motto», une devise empruntée à une composition de Clara, une Mazurka incluse dans son propre op. 6. L’année suivante, il effectua des révisions, changeant le titre en un simple Davidsbündler et ajoutant le sous-titre «Dix-huit pièces de caractère». Lorsque j’ai acheté ma première partition de cette œuvre, en 1975, il se trouve que c’était cette version-là—ce qui n’empêche pas mon interprétation d’intégrer quelques éléments de la première mouture. Je suis terriblement excitée à l’idée de ta seconde Sonate; elle me rappelle tant d’heures heureuses, douloureuses aussi. Je l’aime, comme je t’aime. Tout ton être y est si clairement exprimé et, en plus, elle n’est pas trop obscure. Une seule chose. Veux-tu laisser le dernier mouvement comme il était avant? Mieux vaut le changer et le rendre un peu plus facile, car il est bien trop difficile. Je le comprends et j’arrive à bien le jouer, mais les gens, le public et même les connaisseurs pour qui, en réalité, on écrit, ne le comprennent pas. Tu ne vas pas le prendre mal, dis? Robert ne le prit pas mal et rédigea un nouveau finale qui, il en convint, allait mieux avec le premier mouvement. De ses trois sonates pour piano, celle-ci est, et de loin, la plus concise. C’est une œuvre ample et passionnée, combinant comme toujours urgence dramatique et moments de tendresse ravie. Schumann ne tarde pas à nous demander notre attention: il le fait dès la première mesure, avec ce brusque accord brisé en sol mineur. Le premier défi qu’il lance à l’interprète, c’est quand il marque l’ouverture «aussi vite que possible», pour aussitôt ordonner d’aller «plus vite» et «encore plus vite» avant la fin. Le thème inaugural, imité à la basse, utilise la gamme descendante partielle qui devint la devise de Clara dans maintes œuvres pianistiques de Robert—un «cri du cœur» pour elle, quand ils ne pouvaient être ensemble. Le splendide mouvement lent, marqué getragen (triste), était au départ un lied écrit par Robert quand il avait dix-huit ans. Mais ce calme ne dure pas. Avec le Scherzo survient le seul moment d’humour de la sonate: dans ses épisodes en mode majeur, Schumann avait sûrement les yeux pétillants. Pour dire toute sa nervosité, le «nouveau» finale fait un usage poussé des octaves brisées, et la devise de Clara apparaît dans le second sujet. La musique en vient à un fiévreux apogée et à une pause tragique par-dessus un accord de septième diminuée. La cadenza qui s’ensuit file comme le vent, sans jamais dételer. Clara a certainement obtenu ce qu’elle voulait. … wie Du die Etüden von mir gespielt hast, vergesse ich Dir nicht; das waren lauter Meisterstücke, wie Du sie hinstelltest—das Publikum kann das nicht zu würdigen verstehen—aber Einer saß darin, wie dem auch das Herz pochte von andern Gefühlen, im Augenblick verneigte sich doch mein ganzes Wesen vor Dir als Künstlerin. Ihre Briefe waren jedoch nicht ohne Konflikte. Wenn es eine lange Pause in ihrer Korrespondenz gab, führten die Befürchtungen ob der Gründe dafür zu Anspannungen und sicherlich unvermeidbaren Auseinandersetzungen. Für Robert kann es auch nicht einfach gewesen sein, zu Hause festzusitzen und sich zu fragen, wie er wohl jemals das Geld zusammenbekommen sollte, das Claras Vater als Heiratsbedingung gestellt hatte. Im Februar 1838 schrieb er recht trauervoll, dass sein Weg ein einsamer sei und ihm keine Beifallsstürme vom Publikum zuteil würden, die seine Arbeit stimulierten. Viele andere junge Paare hätten in einer solchen Situation wohl aufgegeben und sich um einen anderen Partner bemüht; die Musik war jedoch ein starkes Band, das sie zusammenhielt. Trotz dieses Elends hatte Schumann jedoch enorme Kreativitätsschübe. Wenn er seine Geliebte schon nicht sehen konnte, schrieb er wenigstens Musik für sie, die sie spielen könnte. Die meisten seiner großen Klavierwerke stammen aus den Jahren von 1834 bis 1839, darunter auch die drei der vorliegenden Aufnahme. Sie sind jeweils recht unterschiedlich, und ergeben daher eine besonders interessante Kombination. Die Kinderszenen op. 15 sind natürlich das berühmteste und weithin beliebteste Werk. Es ist aus zwei Gründen zunächst etwas irreführend: auf den ersten Blick erscheint es einfach—das ist es jedoch überhaupt nicht, sondern es verlangt eine besondere Beherrschung des Anschlags, eine große Ausdruckspalette und eine poetische Darstellung. Zweitens handelt es sich hier nicht einfach um eine Reihe naiver Stücke für Kinder. Schumann bezeichnete sie als „Rückspiegelungen eines Älteren und für Ältere“ und auf eine vernichtende Kritik des Dichters und Musikkritikers Rellstab (der u.a. der Beethoven-Sonate op. 27 Nr. 2 den Titel „Mondscheinsonate“ verliehen hatte) erwiderte Schumann zornig: „Ungeschickteres und Bornierteres ist mir aber nicht leicht vorgekommen, als es Rellstab über meine Kinderscenen geschrieben. Der meinte wohl, ich stelle mir ein schreiendes Kind hin und suche die Töne danach. Umgekehrt ist es; die Überschriften entstanden natürlich später und sind eigentlich nichts als feinere Fingerzeige für Vortrag und Auffassung.“ Schumanns Kindheit war alles andere als idyllisch gewesen: seine Schwester beging Selbstmord, als er 16 Jahre alt war, und sein Vater starb kurz danach. Zudem zwang ihn seine Mutter gegen seinen Willen zum Jurastudium, so dass er sich erst völlig der Musik zuwenden konnte, als er 20 Jahre alt war. [Es war] wie ein Nachklang von Deinen Worten einmal, wo Du mir schriebst „ich käme Dir auch manchmal wie ein Kind vor“—kurz, es war mir ordentlich wie im Flügelkleide und hab da an die 30 kleine putzige Dinger geschrieben, von denen ich etwa zwölf ausgelesen und „Kinderszenen“ genannt habe. Du wirst Dich daran erfreuen, mußt Dich aber freilich als Virtuosin vergessen. Der Zyklus (der letztendlich aus 13 Stücken besteht), beginnt mit Von fremden Ländern und Menschen, dessen einnehmendes Fünftonthema sich durch das gesamte Werk zieht. In der Kuriosen Geschichte wird nicht nur die expressive Basslinie weitergeführt, die schon im ersten Stück erklingt, sondern es erklingen auch ausdrucksvolle Oktavverdoppelungen in der Mittelstimme, die herausgearbeitet werden sollten. Im Hasche-Mann kann man deutlich das Kichern der Kinder hören, die lebhaft herumtollen. Diese Anfangsfigur wird in das Flehen des Bittenden Kindes verwandelt, in dem wunderschöner Kontrapunkt vorkommt und das mit einem Fragezeichen endet. Offenbar hat das Kind bekommen, was es wollte, denn im nächsten Stück hat es Glückes genug. In der Wichtigen Begebenheit kommt das Kind mit seiner eigenen Version zu Wort, was dann jedoch vernünftigerweise gegen Ende austönt und mit einer wunderschönen Überleitung zu einer der berühmtesten Melodien aller Zeiten führt—der Träumerei. Ich habe dies des Öfteren unruhigen Schulkindern vorgespielt um zu zeigen, dass man bei diesem Stück ganz leise sein muss, um hören zu können, was gesagt wird, und habe die Kinder gebeten, gleichzeitig etwas Besonders zu träumen. Wenn man je zeigen müsste, dass Schumanns Musik nicht metronomgetreu in regelmäßigem Rhythmus gespielt werden sollte, so ist dieses Stück ein Paradebeispiel dafür. Und was für ein wunderschöner Kontrapunkt zu der Melodie erklingt! Mit derselben behaglichen Atmosphäre geht es in Am Kamin weiter, obwohl hier auch ein recht lebhafter Dialog stattfindet. Interessanterweise unterscheiden sich die Metronom-Angaben von Clara und Robert zum Teil stark—so etwa bei diesem Stück (Robert gibt q = 138 an, Clara hingegen 108). Das Schaukeln des Ritters vom Steckenpferd ist wunderbar dargestellt, wobei die rechte Hand die hin und her schwingende Bewegung imitiert. In Fast zu ernst setzt sich das Träumerische fort und eine synkopierte Melodie trägt zu der phantastischen Atmosphäre bei. In Fürchtenmachen wechseln sich recht lässige Linien mit bedrohlichen Momenten ab. Schließlich wird es dem Kind alles etwas zu viel und es wird vom heilsamen Schlaf überkommen (Kind im Einschlummern), wobei der Hörer wiederum auf dem letzten Akkord in einem Schwebezustand verweilt. In Der Dichter spricht hat der Erwachsene das letzte Wort. Es gibt in der Musik nicht viele Stücke, die in so ergreifender Weise enden wie dieses. Auf die erste Aussage werden Fragen gestellt, was dann in einem kurzen Rezitativ ausgearbeitet und mit einem Schlussakkord zu Ende gebracht wird, bei dem ironischerweise eine Dezime gegriffen werden muss—etwas, was ein Kind niemals könnte. Woher willst Du denn wissen, daß ich Deine Davidsbündlertänze nicht leiden mag? Bis jetzt bin ich noch nicht dazu gekommen, mich ihnen zwei Stunden allein in Ruhe zu widmen und die braucht man. Solch eine Schrift zu entziffern ist nur mir vorbehalten. In den darauffolgenden Wochen muss sie aber Zeit gefunden haben, sich damit auseinanderzusetzen, da sie am 3. März schrieb, dass ihr die Tänze sehr gut gefielen, aber dass sie ein bisschen zu sehr wie der Carnaval seien, den sie vorzöge. Hier unterscheiden sich unsere Geschmäcker: ich würde eher die „Davidstänze“ (wie Clara sie nannte) zehn Mal spielen, als den Carnaval einmal hören. dem Leid mit Mut bereit. Schumann schrieb an Clara über die Entstehung dieser Stücke: „War ich je glücklich am Klavier, so war es als ich sie componirte.“ Außerdem seien viele mit Heiratsgedanken entstanden (bevor er mit der Arbeit an dem Werk begann, hatten sie sich heimlich verlobt). Doch ist dies nicht so sehr die Art Glück, der man etwa im Carnaval begegnet. Dieses Glück scheint der Trauer zu entstammen—aus langem Leiden und daraus, immer noch nicht seinen größten Wunsch erreicht zu haben. Er schrieb, dass die Davidsbündlertänze sich im Vergleich zum Carnaval wie Gesichter zu Masken verhielten; also betrachtete er offenbar die Tänze als das Wahre. Die Opuszahl 6 ist irreführend und hat nichts mit dem Entstehungsdatum des Werks zu tun. Schumann hatte diese Opuszahl freigehalten, da die Davidsbündlertänze mit einem Motto aus einer Komposition Claras beginnen: eine Mazurka aus ihrem op. 6. Er überarbeitete das Werk im Jahr darauf und änderte den Titel, so dass es einfach Davidsbündler hieß, und fügte den Untertitel „18 Charakterstücke“ hinzu. Dies war die Version, die ich zunächst kennenlernte, als ich 1975 meine erste Ausgabe des Werks kaufte. In meiner Interpretation füge ich jedoch auch einige Elemente der früheren Fassung ein. Auf die zweite Sonate freue ich mich unendlich, sie erinnert mich an viele glückliche und auch schmerzliche Stunden. Ich liebe sie, so wie Dich; Dein ganzes Wesen drückt sich so klar darin aus, auch ist sie nicht allzu unverständlich. Doch eins. Willst Du den letzten Satz ganz so lassen, wie er ehemals war? Ändere ihn doch lieber etwas und erleichtere ihn, denn er ist doch gar zu schwer. Ich verstehe ihn schon und spiele ihn auch zur Noth, doch die Leute, das Publikum, selbst die Kenner, für die man doch eigentlich schreibt, verstehen das nicht. Nicht wahr, Du nimmst mir das nicht übel? Robert nahm es nicht übel und schrieb ein neues Finale, von dem er glaubte, dass es auch besser zum ersten Satz passe. Von seinen drei Klaviersonaten ist die g-Moll-Sonate bei weitem die prägnanteste. Es ist ein Werk mit großer Gestik und Leidenschaft, in dem charakteristischerweise dramatisches Drängen mit Momenten verzückter Zartheit verbunden wird. Schumann wartet nicht auf die Aufmerksamkeit des Hörers, sondern verlangt sie gleich von Anfang an im ersten Takt mit dem plötzlichen, gebrochenen g-Moll-Akkord. Die erste Herausforderung, die er dem Interpreten stellt, besteht in der Anweisung zu Beginn, „So rasch wie möglich“ zu spielen, nur um später zu verlangen, dass „Schneller“ und, kurz vor Ende, „Noch schneller“ gespielt werden möge. Im Anfangsthema, das im Bass imitiert wird, erklingt der absteigende Tonleiterausschnitt, der in vielen seiner Klavierwerke Claras Motto wurde—ein „Ruf vom Herzen“ nach ihr, wenn sie nicht zusammen sein konnten. Der wunderschöne langsame Satz, der mit „getragen“ markiert ist, war ursprünglich ein Lied, das Robert im Alter von 18 Jahren komponiert hatte. Doch hält die Ruhe nicht lang an. Mit dem Scherzo kommt das humorvolle Element der Sonate: in den Durpassagen ist ein gewisses Augenzwinkern zu spüren. Im „neuen“ Finale werden gebrochene Oktaven verstärkt eingesetzt, um die Ruhelosigkeit auszudrücken, und Claras Motto erklingt in dem lyrischen zweiten Thema. Die Musik steuert auf einen fieberhaften Höhepunkt mit einer dramatischen Pause über einem verminderten Septakkord zu. Die darauffolgende Kadenz bewegt sich rasant und lässt nicht einmal nach. Clara hatte zweifellos bekommen, was sie wollte.